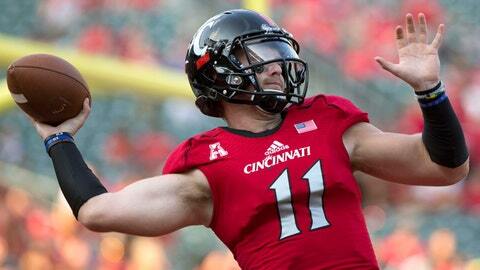 Gunner Kiel did not throw in an incompletion in Cincinnati's 52-7 win Saturday. Cincinnati quarterback Gunner Kiel didn’t have to throw a lot Saturday against UCF but still had one of the best performances in NCAA history. Kiel completed all 15 of his passes — that’s right, zero incompletions — for 315 yards and five touchdowns in the Bearcats’ 52-7 rout of the winless Golden Knights. The 15 completions without an incompletion were the most in the last 20 years, although Kiel was well short of the record for most consecutive completions in a game of 26, set by East Carolina’s Dominique Davis in 2011. A minimum of 20 attempts is required to be eligible for the NCAA’s single-game completion percentage record, which was broken earlier this year by Georgia’s Greyson Lambert, who went 24 of 25 (95.8 percent) against South Carolina. Kiel’s pass efficiency for the game was 388.64, shy of the NCAA single-game record of 403.4, set by Indiana’s Tim Clifford in 1980. Kiel, who missed Cincinnati’s first two games of October after being stretchered off the field following a hit to the helmet during the Bearcats’ loss to Memphis on Sept. 24, has been dominant since his return. Against Connecticut last week and UCF this week, he has combined to completed 82 percent of his passes for 646 yards with seven TDs and no interceptions.